Anthony Batts, the recently terminated police chief in Baltimore, Maryland, told a gathering recently that his former officers “took a knee” after the unrest following the in-custody death of suspect Freddie Gray in an attempt to stymie his efforts at reform. Batts was speaking at a panel discussion at Mount St. Mary’s University in Emmitsburg. 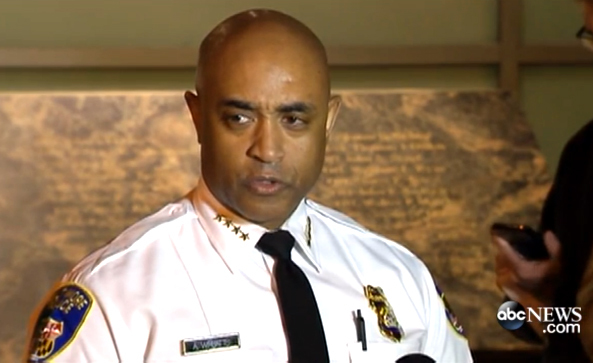 Batts said Washington, D.C., Police Chief Cathy Lanier recently faced a vote of no confidence from her officers, too, when she tried to implement changes in that department. “Is this going to be the tactic, where police don’t feel supported, so they allow the crime rate to go up, and the reformers lose their job?” Batts asked. Batts said he saw the riots coming but blamed resistance to his authority for the management of the various incidents involving clashes between residents and police. Rank-and-file officers say Batts lacked leadership and the rank and file did not trust the chief enough to do their jobs. The problem with whatever reform this Chief may or may not tried to bring, is he did “NOT” provide leadership nor support to his line officers; his lack of understanding of how his line officers were actually working and what they really needed, jeopardized their careers, freedom and lives. He did “NOT” realize that he had written policy in place that was “NOT” in line with what his “ACTUAL” Department policy was. And that is extremely dangerous and detrimental to every officer on the street and every citizen his agency serves. It is also against federal and civil law. He bowed down to the City Elected Officials, telling them what they wanted to hear about reform; but “NEVER” took the time to get down and get dirty and get out on the streets with “his” new officers and citizens to “LEARN” the “PARTICULAR” issues facing “THIS” Agency, THIS Community, THESE Officers, and THESE Citizens. INSTEAD, He Wanted to try his TEXT BOOK THEORY REFORMS, which every great leader and Chief knows has NEVER worked and always failed; because each and every agency and community is different with their own set of special issues, problems and good points. SORRY CHIEF, NOT ONLY DID YOU FAIL YOUR OFFICERS …..YOU FAILED YOUR CITIZENS. This is exactly what you get when you inject politics into police work , you can not run a police force to take down criminals when you play a political game with the lives of the police. What is it that he wouldn’t cover up? Obviously, many of the posters haven’t a clue about the situation in Baltimore. The police department was and still is corrupt, rife with officers that commit crimes on a daily basis, abuse citizens and fellow officers alike. The Chief got one thing right, the reformers will face opposition, many of the officers and the union leadership like things just the way they are. This is what happens when politics takes the place of the safety of your officers and when you don’t take the time to sit down with officers and discuss their fears. Politics will ruin many a good department and stop the flow of proactive candidates for the position of chief of police anywhere. It also deflates the ranks of the officers because it puts their jobs in jeopardy at the whim of a politician who reads books, aligns with theories and has no practical street experience to base his strategy.